are the new stars for this seasons look! Super Strawberry, Chunky Cherry and Whoppin' Watermelon. Super-moisturising lip balm and lip tint properties. Formulated with mango and shea butters to help moisturise and protect the surface of lips. Leaves lips silky smooth with a hint of colour all day long. No sharpening and no mirror required for aplication, just twist the base like a lipstick and apply on the go! If only each Chubby Stick would last forever! Great quality lip balm with super gorgeous chunky packaging. My favourites are Fuller Fig and Whoppin' Watermelon. These Chubby Sticks are a sure hit for Clinique! Which Chubby Stick is your favourite? 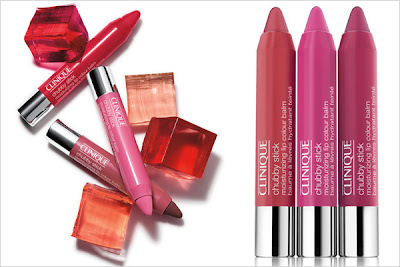 Which Chubby Stick are you lemming right now? I love my chubby stick, think I need to get some more. I've got Whole Lotta Honey and it's gorgeous! Hi GlossQueen! I wanna get some more chubby sticks too! Chunky Cherry is also another one of my favourites. I haven't tried Whole Lotta Honey yet, so I'll make sure I check it out next time I'm at Clinique. I have been wanting to try this! This is basically a tinted moisturizer then ha. I like the Whole Lotta Honey and the red one ha. @emmabovary, Whole Lotta Honey sounds very nice! @Alyssa, you should definitely try these out. You will love them!